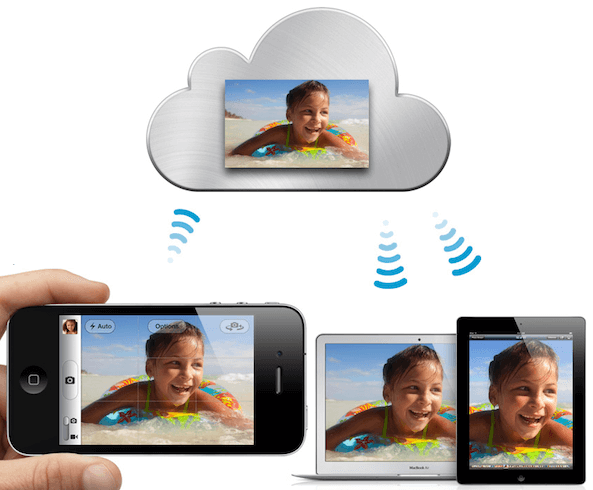 Can You Recover Deleted Photos on iPhone? Can I Recover Deleted Photos on iPhone? 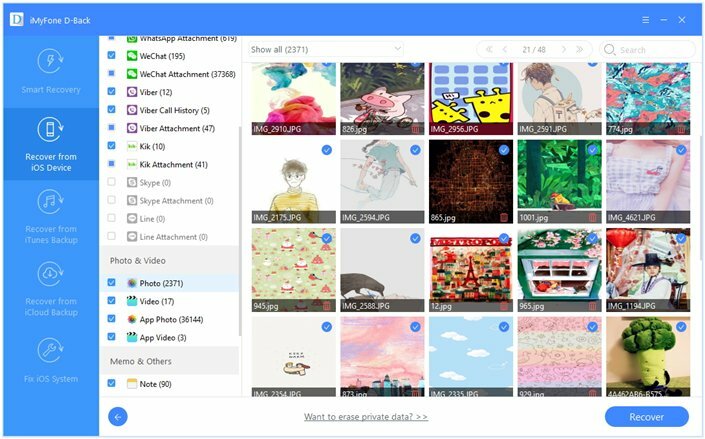 If you have suddenly lost some of the photos on your iPhone, you may be wondering if it possible to recover deleted photos. The question is much more pressing if you don’t have a backup for the photos but you need them back. To answer the question, it is necessary to understand what happens when you delete a file. When a file is deleted, the operating system, in this case your iOS un-allocates the space previously allocated to that file by removing the pointers and marking the space on the drive as available for reuse. The OS doesn’t however delete the file. It remains in the un-allocated space until another file is stored on the device, thereby overwriting the data on it. The un-allocated space on your device contains the data from all files that have been deleted but nor overwritten. But it is not possible to view these files in the traditional way. They can only be viewed with the help of a data recovery computer and forensic software utilities. So the answer to the question is yes. As long as the photos havn't been overwritten, you can easily recover them with the right tools. One of the best ways to recover deleted photos on your iPhone is to use iMyFone D-back iPhone Recovery software. This paid tool comes with a lot of useful features to help you recover most types of data from your device even if you don’t have a backup of the missing data. 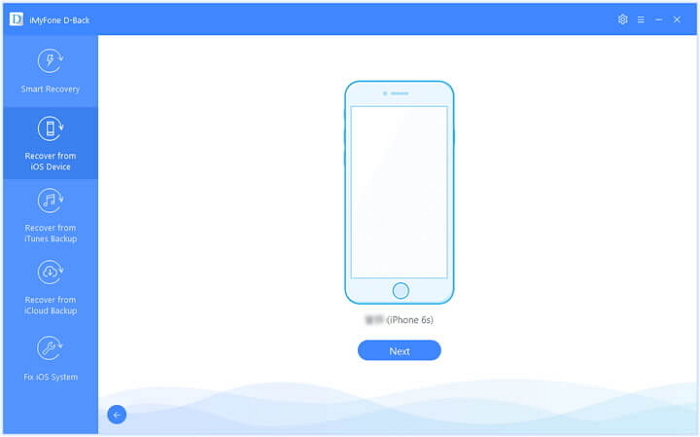 It is easy to use and compatible with all iPhone, iPad and iPod Touch models and all versions of iOS including iOS 12. D-Back also coms very highly recommended by some of the best the news outlets including 9TO5Mac and Techradar. Here’s how you can use D-Back to recover photos from your iPhone whether you have a backup or not. Step 1: Download and install the program on your computer to get started. Step 3: Ensure “photo” is selected as the type of data you want to recover. Click “Scan” to continue. Wait for the scanning process to be completed and then select the missing photos from the results page. Click “Recover” to choose a location on your computer and save the recovered photos. If you have an iTunes backup of the missing photos, you can extract just the photos in these simple steps. Step 1: From the main window, select “Recover from iTunes Backup” and then click “Start.” You should see a list of iTunes backup files on that computer listed in the next window. Select the most relevant one and then click “Next”. Step 2: Select “Photo” in the next widow and then click “Scan” to continue. 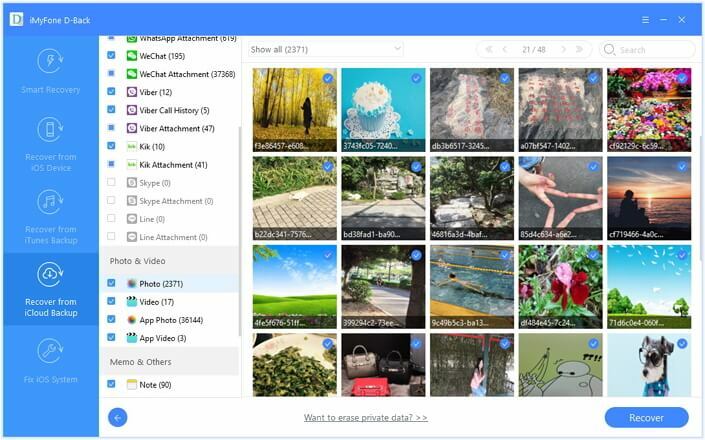 From the results page, select the photos you would like to recover and then click “Recover” to save them to your computer. 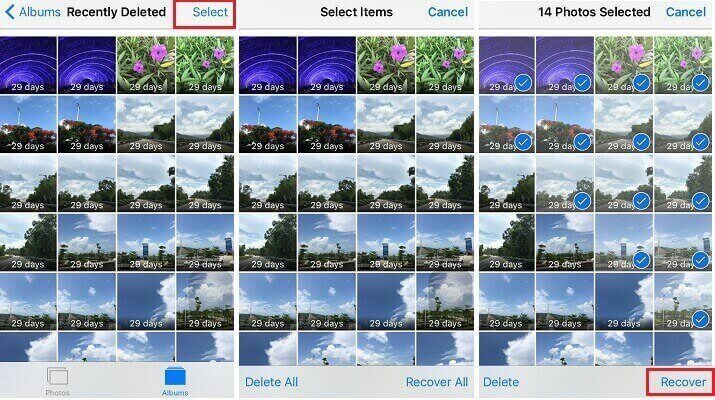 To recover the photos from your iCloud Backup, follow these simple steps. 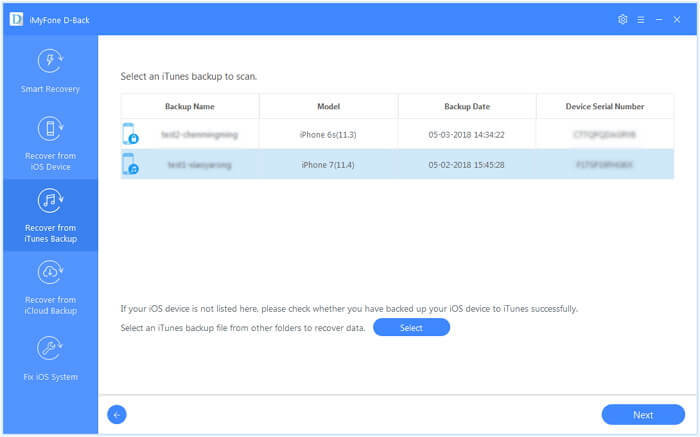 Step 1: From the main window, select “Recover from iCloud Backup” and click “Start.” To gain access to your iCloud backup files, you will need to sign in to iCloud. 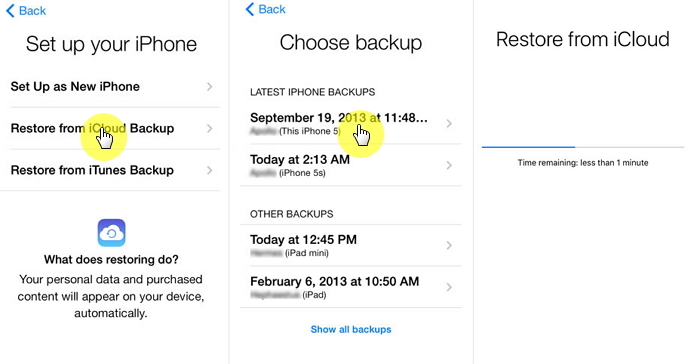 Sign in and then select the iCloud backup file you need. Click ‘Next”. Step 2: In the next window, select the type of file you want to recover as “Photo” and then click “Scan”. The program will scan and analyze the backup file and display its contents on the next page. Select the missing photos from the displayed results and then click “Recover” to save them to your computer. Step 1: Open the “Photos App” on your device and then scroll down to find and select the “Recently Deleted” folder. Step 2: Tap on the photo you would like to recover and then click on “Recover” at the bottom. Step 1: To restore via iTunes connect the iPhone to your computer and launch iTunes. 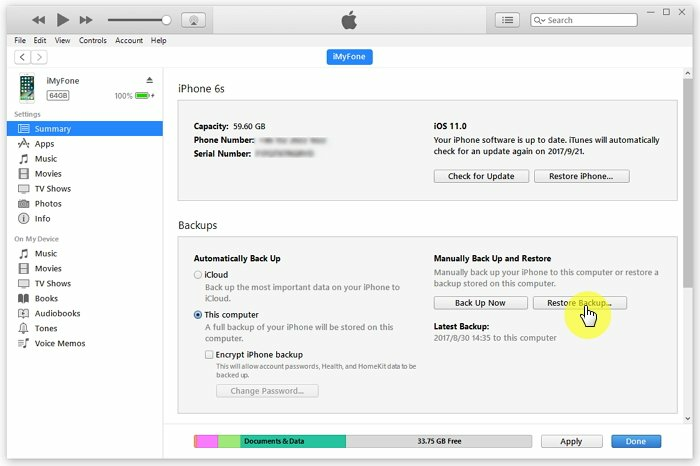 Step 3: Select the most relevant backup and then click “Restore.” Keep the device connected through the entire process. Step 1: Unless you are setting up a new device, you will first have to erase all data and settings. To do that go to Settings > General > Reset > Erase All Contents and Settings. 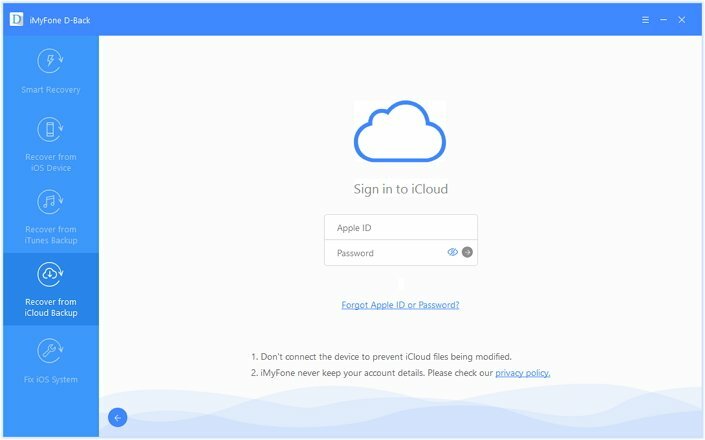 Step 3: Sign in to iCloud, select a relevant backup and keep the device connected to a Wi-Fi network until the process is complete. Step 3: Tap on the “Share” icon and then choose “Save Image” to save the photos to your device.